Is anyone else planning on building the SEQ V4+ once kits become available? Full kit availability is expected within the next few months. I think this would make a killer sequencer for a modular system. I am. Been wanting to build a Midibox SEQ for ages and this iteration looks amazing. Me too. MidiBox has been on my radar for years - having enough key bits, BOMs, and a decent case in one place at the same time would be tipping point for me. Folks running the shop seem very helpful / responsive too. I’m hoping that they stock a Euro breakout panel. I've had a v4 control surface PCB, the core, a lot of parts and some other stuff ready for the project for a while. I've just basically been feeling too thrifty to order a panel from julian or Schaeffer and haven't wanted to order the rest of the parts and populate the CS before I have the actual panel to fit everything with. Now I'm kind of undecided whether I should build v4 anyway (it won't suddenly get obsolete as a new better iteration surfaces) or just get rid of the CS PCB and wait for 4+. The Matias switches and level of integration + additional workflow features are an obvious plus, but then again I originally ordered the v4 CS PCB because that system seemed really good to me as well. That’s, uh, quite fancy. The price of those OLED displays alone is more than the total cost of many of my DIY projects. Always wanted an MBSeq, but I think I’ll stick with the standard v4 if I ever make one. I do have two Raystar 2x40 OLEDs waiting for my normal v4, I think they were cheaper than those even fancier OLEDs there. That brings up a good point in general though. I kind of like that stuff looks subdued - or, if flashy and fancy, then more in sort of a retro way. 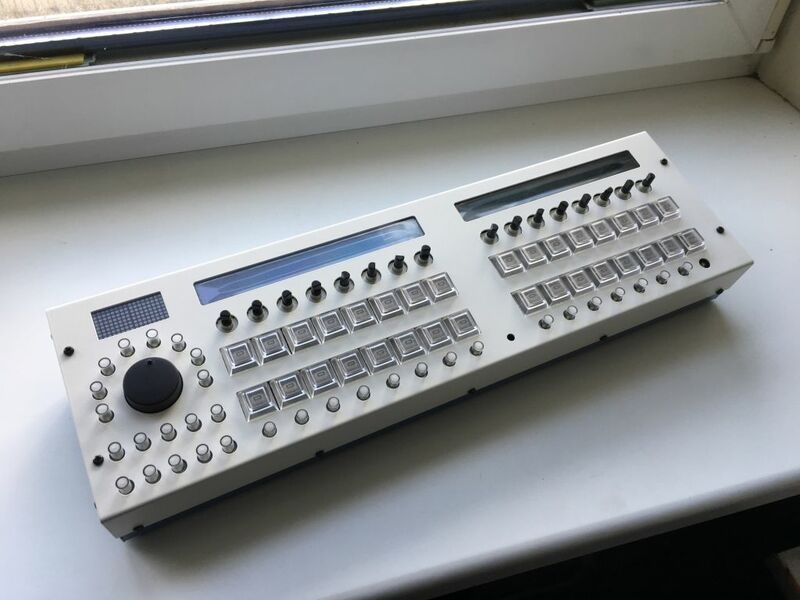 At least the prototype with the sea of translucent buttons and bright superflux LEDs against white background looks very "now" (or at least very "5-10 years ago") which is not a positive thing in my home studio. I reckon it looks pretty nice . Note that the silkscreen is not yet completed and you might see that there are two different cap heights for the Apem (MEC) switches. The old design used a larger datawheel, so had the PCBs mounted at different heights. We are in direct contact with the supplier of the OLEDs. There are other types available but the case dimensions are too tight for the taller ones. The Wilba control surface is available at Modular Addict for those who don't like the design, SMT (all wide-pitch) soldering or the price. For those who like the look of it, I hope it's (finally) an accessible way of completing a MIDIbox SEQ. For those who like the look of it, I hope it's (finally) an accessible way of completing a MIDIbox SEQ. Don’t get me wrong. This isn’t the MBSeq for me, but it definitely fills at least a couple niches in the lineup that were sorely lacking. The Wilba version is less costly, but it’s a very complicated project for beginners with disorganized documentation and little standardization. This seems like it’ll be a better choice in that regard, as well as offering some nice upgrades (both cosmetic and practical) to those who want them. I wonder if they’ll ever put that awesome fm synth into a consolidated kit like they’ve done with this. I’d be all over that. There's a couple MIDIbox FM projects nowadays. The original MIDIbox FM is based around the OPL3 chipset and actually did get a release as a kit in the form of the sammichFM, though it was a Shruthi-style one-knob menu monster. The kits are long gone though, and despite a somewhat steady demand for them, the people who did the kits seem to have completely ghosted from the scene taking all their PCB design documents with them. More recently, there's been work on the MIDIbox Genesis, which is based around the FM chips used in the Sega Genesis. Also a monster of a synth, but no kits. Laying out a new version of the sammichFM (or hell, going for a full control surface a la MB-6582) has been on my to-do list for a long time, but its a big task and something always gets shuffled in front of it. I got my OPL3 chips waiting in a drawer for the day it happens though.